Update: more details available on Sariel's site. 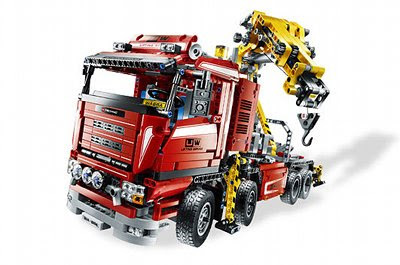 The second half of the year is upon us so more and more details are available about the forthcoming Technic sets. The 8263 Snow Groomer has 590 parts and sports treads and shovels in the front and back, both adjustable. We have already covered the 8265 Front Loader. Now it is clear that it consists of 1091 parts and has a V6 engine with gearbox and most likely an all wheel drive with multiple differentials. The linear actuators move the bucket in the front. The new flagship is the 8258 Crane Truck. This set has 1877 parts and will probably contain a hostload of working features. 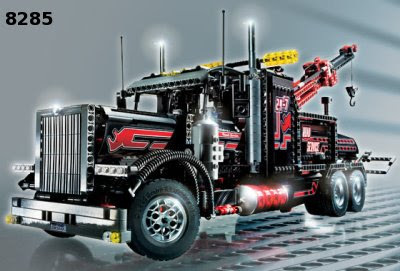 We expect a V8 engine and gearbox, but it will certainly have adjustable supports and a fully functional crane as well. The Power Functions family made by Lego got two new members not so long ago. The 8878 Rechargeable Battery can be recharged without removing it from the model - something that does not always work with normal AA batteries. The power output can be adjusted to 7 levels. Its companion 8887 Transformer helps recharging it. Sariel provides a host load of details on his web page. 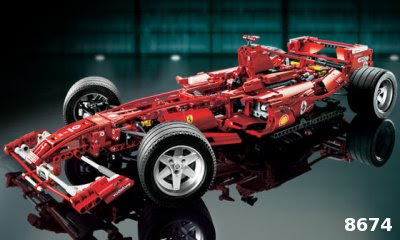 You probably know that I like Technic cars, especially if they are big and have a lot of parts that can be move. I already have an 8880 but somewhere in a distance I see a goal to have all the earlier sets of the big car series. Take the 8865 for example. 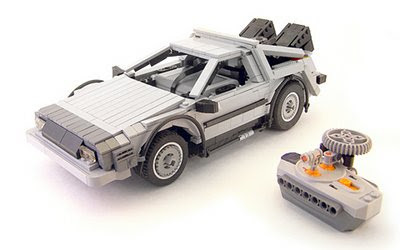 It was sold between 1988 and 1994 and one can find many for sale on EBay or Bricklink. It takes some courage, I admit it. Based on the photo it is not sure that it has four wheels, for example. It is sure though that it has many extra parts like the yellow wings that were not part of 8865. I still have to wait a couple of weeks before I can actually grab it with my hands. I will keep you posted. History of the big Technic cars, Part III. In the final part (Part I, II) we take a look at models after 2004. This period was heavily influenced by Ferrari and the emphasis on the looks of the models got even stronger, especially with the ones running as part of the "Racers" series. The era of Racers was started by model no. 8653 "Enzo Ferrari 1:10" in 2005. The car is a replica of a real Ferrari Enzo. 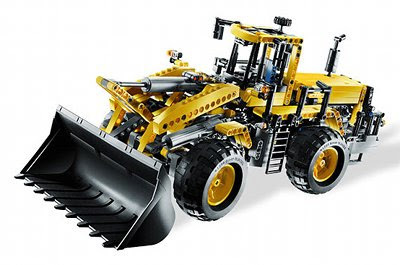 Just like the 8435 introduced in the previous part it consists entirely of studless bricks. 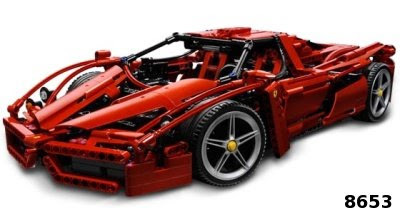 A first in the history of Technic cars, it sports a V12 engine but this brings us almost to the end of the list. Unlike the previous models there is no gearbox or suspension. Steering, upwards opening doors and the differential represent all the features. 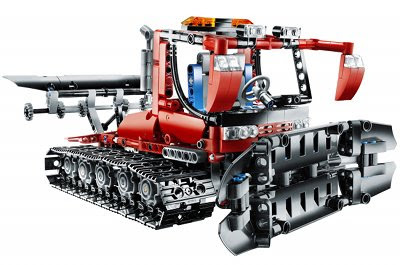 This list is too short for many Technic enthusiasts especially considering that the set contains 1360 parts. 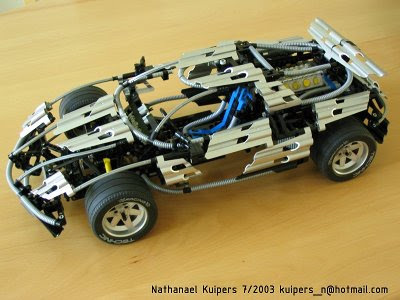 The next set is also a Racer, the 8674 "Ferrari F1 Racer 1:8" appeared in 2006. Its features are very similar to the earlier Silver Champion (8458) and Williams F1 Racer (8461) but the car was completely redesigned. Like on the previous Ferrari we do not find any studded elements here either. The engine is V8 because of F1 rule changes, the rest is the same: suspension on all four wheels, differential, steering and the engine hood opened with a damped spring of course. 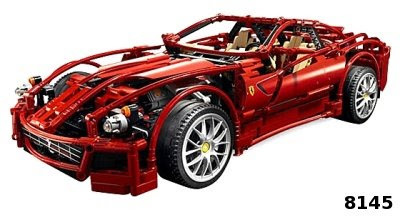 The last Ferrari is the 8145 "Ferrari 599 GTB Fiorano 1:10". This is the first set in the series that can be found in the shops today - of course others may appear occassionally from earlier stocks. The 8145 is the successor of Enzo with the same working features (and the same missing) and of course with the doors opened upwards. Now let us see what has happened in the Technic line. The models still try to pack many features, but there are no supercars at the top of the range any more. 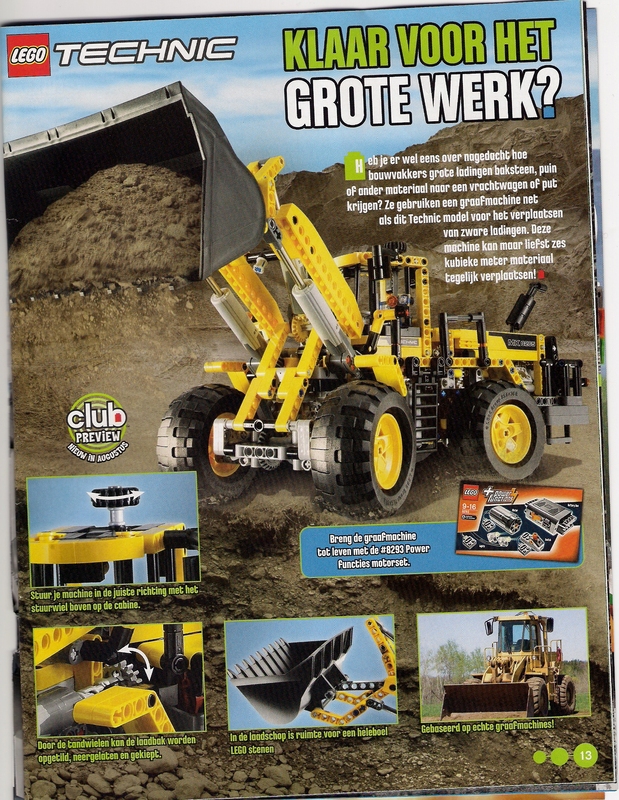 Instead, we can find a crane (8421 from 2005), a powered bulldozer (8275 from 2007) and a harvester (8274, also 2007). While the 8285 "Tow Truck" is not exactly a supercar either, this is the most car-shaped of all of the above. The set contains a V6 engine, steering and differential, plus there are many ways to control the towing part, including pneumatics and various control wheels. With this we have arrived to the last set in our series, the 8297 "Off Roader". It arrived in stores late 2008. It is similar to its off terrain predecessor 8466: suspensions on all wheels, rear wheel drive and a differential provide the foundations. It introduces many new concepts as well: as the first set in our history series it includes power functions by default and this can be used to adjust the height of the suspension. For more details, take a look at our post about 8297. The selection has changed a lot since the introduction of the first supercars. The cars can do more and more and contain more special parts as well. But the most important change is the massive increase in choice: instead of the old cars sitting on the throne alone one get real variety today. 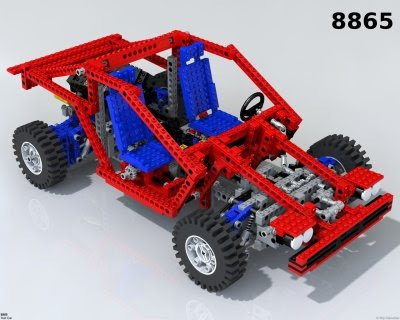 The 8297 is a worthy contender here with many interesting solutions. We can only hope that there remain new things for the future as well. Speckboy has published a list of the 24 all-time best stop motion animation movies with Lego minifigs. The list contains classics like Terminator, Pulp fiction and episodes of Star Wars. 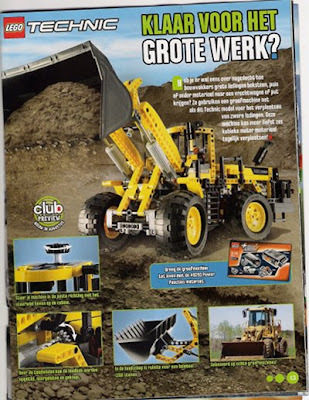 TechnicBRICKs published new details about the yet-to-appear 8265 Wheel Loader set. We can expect quite exciting things like the Linear Actuators moving the bucket - they are like the older pneumatic elements but work with electric power. Most of the time I am a pacifist except when it is about warbirds. I have built this airplane about a year ago but it was not covered on the blog yet. The goal was to build a Messerschmitt Bf-109G "Gustav" fighter plane from WWII. The original plane is probably the most well known German fighter plane from the era that flew in many air forces in the world including the "Puma" Air Defense Wing. Ordering on the site is limited to western countries. The price is approximately 80 USD. It may happen that some parts have run out of stock. Best is to download the LDD file, swap the critical parts to something else and it is ready to be ordered. The way the plane was designed and built means the use of colors is ... cough ... interesting :) Most of it is black because most Lego parts are available in black. The undernose is yellow becuase a similar scheme was used on German elite squadrons. The tail has a Hungarian flag though. After I got it from Lego I replaced the propeller with a 3-feather one using Technic parts and it got an undercarriage. To check out the details please visit the album. We did not covered the 8458 Silver Champion race car on the blog yet. Nevertheless, one of our faithful readers, gzurti pointed me to this model built by Nathanel Kuipers using only parts available in 8458. Nathanel was so thorough that he provided full building instructions so it can be built by anyone havin a 8458 (or a blue-white 8461). 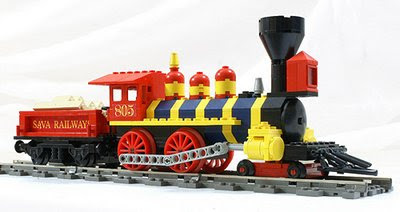 Lego bricks are not only for cars and aircraft, one can make locomotives as well. Just like Tony Sava does it. He introduced his newest creation, the Chesapeake & Ohio H8 Allegheny class locomotive that is the biggest locomotive ever made. Its empty weight is no less than 328 tons and fully prepared it can weight more than 480 tons! More locomotives from Tony Sava here. 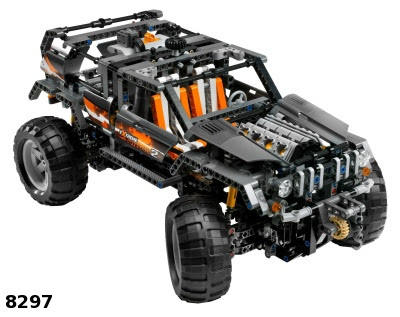 In Technic, Agents and Space Police sets set to appear in the second half of the year there are new technic parts: 63869, 64178, 64179 és bb399 és 85943.